Digestive health Archives - Katie Gaffney, OMD, L.Ac. Many Americans suffer from acid reflux and frequently use acid suppressing medications to manage their symptoms. Acid reflux is caused by gastrointestinal dysfunction and poor diet. When we eat unhealthy foods such as sugar, breads, dairy, greasy or processed foods, and eat heavy, rich meals our stomachs can have difficulty with digestion. Taking a pill to ease symptoms in the short term or using a preventative daily acid suppressing medication may seem like a good idea, but it actually causes many long term problems. It also does not address the root cause of the acid reflux. Surprisingly, acid reflux is often caused by LOW stomach acid! Excess acid is often not the problem, but rather minimal acid back up into the esophagus due to poor digestion, overeating or sphincter dysfunction. Continuing to eat unhealthy foods and taking acid blocking medication for years or decades is one of the worst things you can do for your health. Since the medications are working to further reduce possibly already low stomach acid, they make the whole situation much worse and can lead to serious chronic conditions. Let’s take a closer look at low stomach acid, what causes it and why it is a problem. What are the causes of low stomach acid? What are the consequences of low stomach acid? What are the symptoms of low stomach acid? What supplements can help with digestion? What other ways can I aid digestion? This blog is intended for educational purposes only. Please see a trained professional before making any medication or supplement changes. It is never a good idea to abruptly quit medications or to do so without proper supervision. Blood sugar regulation is vital to the proper functioning of all major body systems. Blood sugar plays an especially important role in digestive, adrenal, immune, thyroid and brain health. Chronic dysglycemia, or poor blood sugar regulation, could lead to obesity, hormone imbalances, adrenal fatigue, hypothyroidism, kidney disease, and much more. When it comes to dysglycemia, the two main areas of concern are hypoglycemia and insulin resistance. Hypoglycemia is low blood sugar. This usually happens in response to an insulin surge from eating a meal high in sugar or carbs. These insulin surges and subsequent glucose drops are problematic if they happen repeatedly throughout the day causing blood sugar levels to constantly swing from high to low. If you skip meals or you are not eating enough protein and fat as fuel, only relying on sugary foods, you will notice repeated crashes in energy and cognitive functioning. On the other hand, if you are constantly eating excessive amounts of sugar, the body has to constantly pump out insulin to process the glucose and get it into the cells. After an extended period of time, the body gets to a point where it just doesn’t take this message seriously anymore, starts to ignore the signal, and the cells become resistant to insulin. When glucose can’t get into the cells to provide energy, proper cellular functioning fails, symptoms begin and the excess sugar in the system gets stored as fat. Let’s take a look at some of the symptoms of hypoglycemia and insulin resistance. It is possible to have a combination of the two issues and having hypoglycemia could lead to insulin resistance. How we eat and what we eat is so important and central to improving and maintaining good health. Unfortunately, the standard American diet is setting us up for failure. Americans have become much too addicted to sugar and much too reliant on fast food and processed/packaged foods. These foods are low in useful nutrients and very high in sugar, refined carbs, and harmful chemicals. So where do you begin in getting your blood sugar under control? First figure out where you currently stand. Look at the symptoms above and decide if you are dealing with hypoglycemia, insulin resistance, or both. 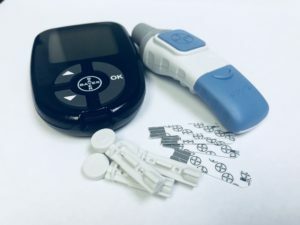 Buy a glucometer and check your blood sugar upon waking. Ideally, you want the number to be between 85-99 mg/dL. Write that number down and start tracking it every morning. Get blood work done to check your A1C. This measurement reflects a 3 month average of your blood sugar and will tell you if you are pre-diabetic or diabetic. Ideally, this number should be between 4 and 5.6%. Once you’ve identified a problem, start making positive changes. Change your diet! This is a must. Don’t put the temporary pleasure of a sweet treat above a lifetime of good health. Reduce or cut out grains, sugar, packaged foods, fast food, soda, fruit and fruit juices. Eat more vegetables, meat, nuts, beans, and healthy fats like avocado, olives, and coconut oil. Intermittent fasting is a good idea for the insulin resistant group (not the hypoglycemic group). Intermittent fasting is when you only eat for 8-10 hours/day. For example, only eat from 12p-8p every day. If you get hungry late at night or in the morning, you can have a tablespoon of coconut oil. This lets the pancreas and digestive system rest and restore and reduces the insulin response. For those with hypoglycemia, make sure you eat regularly. Have small meals every few hours, especially protein upon waking and never eat sugar or carbs alone, always pair with protein and fat. Get at least 30 minutes of moderate aerobic activity daily, think walking, hiking, yoga, swimming. These activities will burn fat and lower blood sugar levels. Book an appointment with a holistic health care provider who can work with you on diet, interpreting blood work, and prescribing supplements and herbs. Get regular acupuncture treatments! Acupuncture has been shown in research to reduce A1C, regulate hormones like insulin, and help the body process glucose. Completely changing the way you eat and breaking bad habits can be very difficult and kicking the sugar addiction can be as challenging as a drug addiction, but that highlights how important it is. You do not need any food or substance to have that kind of hold over your life and your health. You also don’t want to go down the road of diabetes and lifetime of medications and side effects, nerve damage, kidney failure, loss of eyesight, amputations. It’s not a pretty picture and is unfortunately the reality for too many Americans right now. Get help today to start making positive changes in your life. Contact Dr. Gaffney through the Connect tab for an appointment. With summer around the corner, I get asked almost daily, “Can acupuncture be used for weight loss?” The answer is yes, but it may not be in the way you think; it’s a bit complex. The needles themselves don’t make the pounds melt away and there are no “weight loss points”. The way acupuncture aids weight loss is by harmonizing any underlying imbalances in the body and by promoting the best environment for weight loss to be possible. The benefit of weight loss would come secondary to a balanced body. The following are some of the variety of ways acupuncture indirectly promotes weight loss. – Acupuncture regulates hormones such as insulin, cortisol and thyroid hormones which may be negatively affecting metabolism, fat storage, and cravings. – Acupuncture calms the mind and relaxes the body which improves mood, desire and motivation to exercise and diet. Relieving stress also lowers cortisol which when raised leads to excess abdominal fat. – Acupuncture relieves back, neck, hip, and knee pain that may be interfering with exercise. – Acupuncture promotes digestion which helps reduce bloating and constipation. – Acupuncture can also boost energy which has many obvious benefits. If you feel you are working hard to lose weight and not getting any results, acupuncture would certainly be a beneficial addition to your program. But if you aren’t eating healthy or exercising, don’t expect a miracle, the results will be minimal. Eating healthy is the most important factor in weight loss. Keep your diet plan simple and not too restrictive. Cook at home more and cut back on packaged/processed foods. Focus on increasing fiber, protein, and healthy fats. It has been a long disproved myth that eating fat makes you fat. Modern research promotes eating mono and polyunsaturated fats such as nuts, avocado, salmon, tuna, olives, and flaxseed to lose weight. In TCM terms, acupuncturists say avoid “damp” inducing foods such as raw, cold foods like salads, smoothies, fruit, dairy, and icy drinks. Eat more foods that are warm and gentle on your digestive system such as steamed veggies, white rice, soups and stews. Too much damp in the body leads to fatigue, sluggish digestion, and weight gain. To boost your weight loss plan consider adding one or two of the following supplements. – Omega 3s increase metabolism and reduce belly fat. – Vitamin D has a role in telling cells to burn fat. – Green tea, an antioxidant, reduces appetite and boosts metabolism. – Fiber supplements, probiotics, and digestive enzymes all promote healthy digestion. Don’t over do it on supplements, use as directed. More does not equal better. If you are taking medications, talk to your acupuncturist before starting supplements. As with any acupuncture treatment plan, it’s important to commit to frequent and recurring treatments for better and faster results.